New Delhi: TLC, India’s favourite lifestyle destination is back with a brand new season of MASTERCHEF CANADA. After an exciting and successful run with the first season, the competition is back with top home cooks from across Canada who will battle for the title of Canada’s MasterChef. Returning judgeson the series will include celebrity chef MICHAEL BONACINI who is the co-founder of one of Canada’s leading fine dining restaurant companies, CLAUDIO APRILE,one of Canada’s most celebrated and visionary chefs and ALVIN LEUNG, the self-proclaimed ‘Demon Chef.’On the line will be sixteen of Canada’s best home cooks who will be tested on their culinary skills and their ability to translate their vision into great dishes to impress the judges. MASTERCHEF CANADA willair every Friday to Sunday at 8 PM, on TLC. With Season 1 of the series receiving a great response from viewers across the country, the new season promises to take the excitement and thrill to the next level with intense competition amongst the contestants. In each episode, judges will raise the stakes with new mystery box challenges, pressure tests and team challenges designed to bring the best out of the contestants. The series will feature contestantswho will present their creatively crafted dishes with the hopes of turning their culinary dreams into reality. 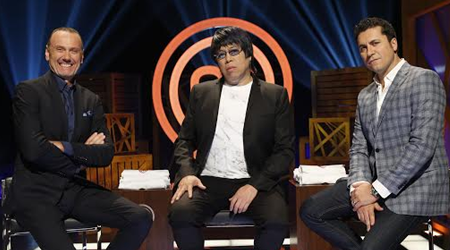 After surviving a series of showdowns, the grand finale will witness a battle between the top two cooks for the title of MasterChef Canada.Only one will emerge victorious and lay claim to the title of MASTERCHEF CANADA. Tune in to find out who wins the title ofMASTERCHEF CANADA, everyFriday – Sunday at 8pm, only on TLC!